The Intel® Xeon® processor E5-1600 v2 and Intel® Xeon® processor 2600 v2 product families datasheet volume one provides DC electrical specifications, signal integrity, differential signaling specifications, land and signal definitions, and an overview of additional processor feature interfaces. This document is ...intended to be distributed as a part of the complete EDS document which consists of two volumes. The structure and scope of the two EDS volumes are provided in Table 1-2. The Intel Xeon processor E5-1600 v2 and Intel Xeon processor E5-2600 v2 product families are the next generation of 64-bit, multi-core enterprise processors built on 22-nanometer process technology. Throughout this document, the Intel Xeon processor E5-1600 v2 and Intel Xeon processor E5- 2600 v2 product families may be referred to as simply the processor. Where information differs between the EP SKUs, this document uses specific Intel Xeon processor E5-1600 v2 product family and Intel Xeon processor E5-2600 v2 product family notation. Based on the low-power, high-performance 3rd Generation Intel® Core™ Processor Family microarchitecture, the processor is designed for a two-chip platform as opposed to the traditional three-chip platforms (processor, MCH, and ICH). The two-chip platform consists of a processor and the platform controller hub (PCH), and enables higher performance, easier validation, and improved x-y footprint. 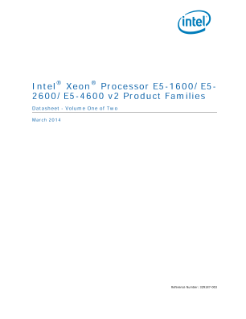 Read the full Intel® Xeon® Processor E5 v2 Family: Datasheet, Vol. 1.